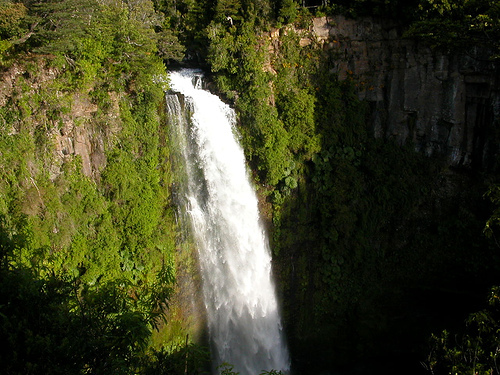 Accumulating first in a lake on the flanks of Volcan Tolhuaca, the Rio Malleco then plunges off a breathtaking 50 meter (165′) falls before starting its western journey towards the Pacific Ocean. It is at the base of Salto Malleco that the whitewater journey begins. Nathan Sullivan first ran this in early December of 2004 and I believe it has not yet been repeated. Nate describes the run as mostly class 3-4 with one distinct class 5 stretch that includes an S turn rapid into a 6 meter falls. On their run the water was on low side so best to get there in early to mid spring runoff (October-November). I went to check out the river in January 2009 and it was too low. To get to river there are two options. the first is to come in from Ruta 5 at the Inspector Fernandez exit which is a few km north of town of Victoria and about 60 km from the Northside of Temcuo. From here take the gravel road R-71 to the western park entrance approximately 50 KM to the east. Pass the lake (Laguna Malleco) and turn left to reach the CONAF park entrance. Ask for permission to drive your vehicle past the camping area a few hundred additional meters around the north side of the lake. Yo can then walk with your boat on the well maintained 1.8 KM “El Salto” trail or do what I did and hop in your boat and paddle accross the lake to the top of the falls then hike boat down to river on a good fisherman’s trail. The other way to reach the river is from the Curacautin. From Curacautin follow the gravel road 30 KM to the Termas de Tolhauca then another 8 km to Laguna Malleco. The takeout is a bit tricky to find. Use the link to view map below and find where vertical intersection of line 42 with horizontal line intersection between 69 and 70. Here a logging road goes down and crosses a bridge over the river. This takeout at 575 meters is about 13 km from the base of the falls which are at 850 meters making the average gradient 21 m/km or 105 FPM. Follow road from lake back towards Ruta 5 about 16 km to small village of San Gregorio. Turn right and go north 4 km and go straight on small road where there is a major bend to the left. Go about 500 meters then turn left follow this road about 5 km until you come to the river. On the way you will pass a small creek and then have switchback descent down to river. Best to ask locals for accurate directions. While in the area it is worth visiting the Tolhuaca National park which does not see much traffic and has some excellent hiking trails. Nearby Tolhuaca hot springs are pricey but strategically located to combine with this river trip. Organized camping is available on the north side of Laguna Malleco. Inquire at CONAF office for pricing.